From Châteauneuf-du-Pape in the Rhône Valley to Oregon's The Rocks to Hawke’s Bay, these winegrowers all love being stoned. In an idealized world where manicured vines flow toward the blue horizon in uniform rows across undulating slopes, there exist some vineyards that are true terroirs of terror. Rocky vineyards wear out tractor tires, bend heavy equipment, prove treacherous to pickers and cause winegrowers to postpone replanting. The only thing they’re good for is to produce grapes that make some of the world’s most-valued wines. Call them rocks, stones, galets roulées, pebbles, cobblestones, pudding stones or simply large gravel. Collectively, they form massive fields of oblong stones deposited by ancient rivers that sit on the surface or just a few inches beneath it. The best known of these regions are Châteauneuf-du-Pape in France’s Rhône Valley, Gimblett Gravels in New Zealand’s Hawke’s Bay and The Rocks District of Milton-Freewater American Viticultural Area (AVA) in the Oregon side of the Walla Walla Valley AVA. “The stones have excellent drainage, heat retention and radiation, which lifts temperatures into [the] zone where we can fully ripen late-harvesting reds, including Cabernet Sauvignon,” says Gordon Russell, senior winemaker at Esk Valley Estate in Gimblett Gravels. While the regions are similar in composition, they differ in geologic histories and wine traditions. The galets of Châteauneuf are composed primarily quartzite and are believed to be of Alpine origin. Although the area has produced wine grapes since Roman times, it received its name and notoriety in the 14th century when the papal palace—the new castle of the pope—was relocated from Rome to nearby Avignon. While the stone deposits in the Walla Walla region and Gimblett Gravels are also ancient, their transition to vineyard land is recent. In 1997, French winemaker Christophe Baron planted his “Cailloux” vineyard in the Milton-Freewater AVA, the first vines for his Cayuse brand. Now known as The Rocks District AVA, its signature stones are composed entirely of basalt washed down from the nearby Blue Mountains. Gimblett Gravels also has a unique geological lineage. It contains mostly greywacke, a type of sandstone, washed down from the North Island’s central mountains. The land where the vineyards are now located was underwater until 1867, when a massive flood changed the Ngaruroro River’s course about 10 miles inland from Hawke’s Bay. When the floodwaters receded, 2,000 acres of gravel and soil were left behind. Vineyards were first established just over 100 years later, when Chenin Blanc and Müller Thurgau were planted in the Mere Road vineyard during the late 1970s. By the end of the century, major plantings of red Bordeaux varieties took place, which now make up 81% of the vineyards. Even in these regions famous for their rocks, some vineyards do not have surface gravel. “The galets get all the attention and all of the photographs, but there are two other soil types that make up Châteauneuf,” says César Perrin, whose family owns the very iconic and stony Château de Beaucastel. He points to a sandy limestone mixture and another made up of sandy clay. While other grape-growing regions have large deposits of rounded river stones and other rocks, like the left bank of Bordeaux, the stones tend to be located further beneath the surface. Although the stones provide drainage and attractive mineral components, they don’t provide the radiant heat of exposed gravel. Grape growers in these rocky regions also struggle. “It costs more money to grow grapes in the stones, and you have more vine damage,” says Baron. Arguably, Châteauneuf-du-Pape wrote the playbook for vine growing in the gravel. Mainly, the vineyards are head-trained in the gobelet method, with fewer vine rows or trellis wires. The low-hanging bunches receive radiant heat from the ground well after sundown. As with the other stony vineyards, the yields are naturally reduced. What really matters is how these growing conditions are reflected in the wines. “If you compare wines made from stony vineyards with those grown on soils nearby, they are firmer, more focused, have a riper palate and more minerality,” says Smith. “With Châteauneuf, the wines are more elegant, even delicate, and Grenache on the stones has better aging potential than elsewhere,” says Guigal. “The terroir takes over the grape variety, especially Cabernet, giving great savory qualities,” say Baron. While many different Rhône and Bordeaux varieties have grown well in Gimblett Gravels, Russell, who also heads the winegrowers’ association, believes one variety shines there. “Merlot is by far the most widely planted variety, and the Gimblett Gravels is one of the rare places in the world outside of Bordeaux where this variety seems to produce quality wine,” says Russell. But in an age of rising global temperatures, can rocks that radiate heat be too much of a good thing? Earlier harvests due to faster ripening pose no problem, but increased sugar generally converts to higher alcohol levels. Perrin says that climate change has led Beaucastel, which farms organically, to do more work in the vineyard. “We keep more leaves on the vine to protect the grapes from sun, and we do less green harvesting [removing excess grape clusters during the summer] to avoid too much fruit concentration,” he says. Châteauneuf combats high alcohol levels in other ways. It allows up to 13 grape varieties in its blend, and also includes less-stony vineyards within the appellation. 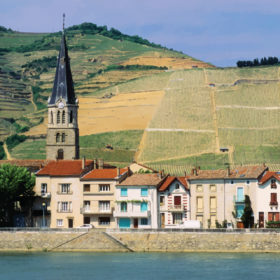 Some of the world’s rockiest vineyards, Châteauneuf included, also produce excellent white wines with such heat-loving varieties as Roussanne and Grenache Blanc. Is there a unity among people who grow grapes under these rocky conditions? Yes and no. Many New World producers that grow Syrah emulate the Northern Rhône add a little white wine from Viognier either during fermentation or blending, something not permitted in the Grenache-dominant Châteauneuf. But, when it comes to the challenges of farming, there seems to be an informal Brotherhood of the Galets Roulées. “I grew up drinking Châteauneuf, and I always have a bottle of it on the table,” says Baron.